Joint Industry 3i Symposium with Hydro-Québec! Download a PDF Hydro-Quebec 3i Symposium schedule. GlobalSIP and Hydro-Québec are pleased to announce they have joined forces to align the programs of GlobalSIP 2017 and Hydro-Québec 3i Symposium. This partnership will bring over 200 practitioners from the industry and Hydro-Québec network of partners and collaborators. 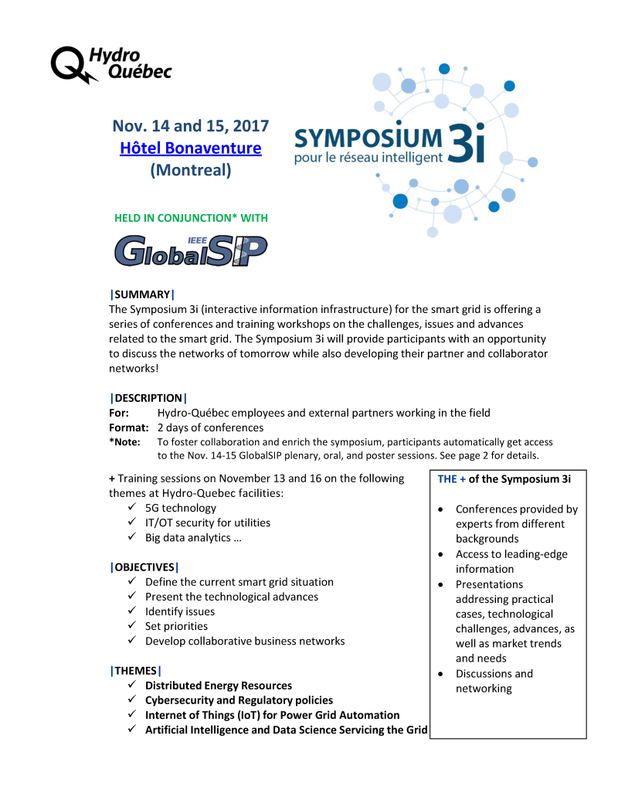 All GlobalSIP attendees will automatically have access to the public segments of Hydro-Québec 3i symposium, including joint plenary, oral, and poster sessions. With close to 20,000 employees, Hydro-Québec is one the world’s largest hydropower producer, active in reservoir management, production, and transmission of electricity in the Province of Québec and Eastern North America. This year’s edition of Hydro-Québec focuses on themes of special relevance to the signal processing community, including Cybersecurity, IoT for Power Grid Automation, and Artificial Intelligence and Data Science Servicing the Grid. Do not miss this opportunity to make new acquaintances, extend your network and develop partnerships.